Seven students from the Pulaski School District received awards during the 19th Annual Oswego County Student Art Show and Competition at the Salmon River Fine Arts Center on April 6. The art show and competition featured works from students across Oswego County. 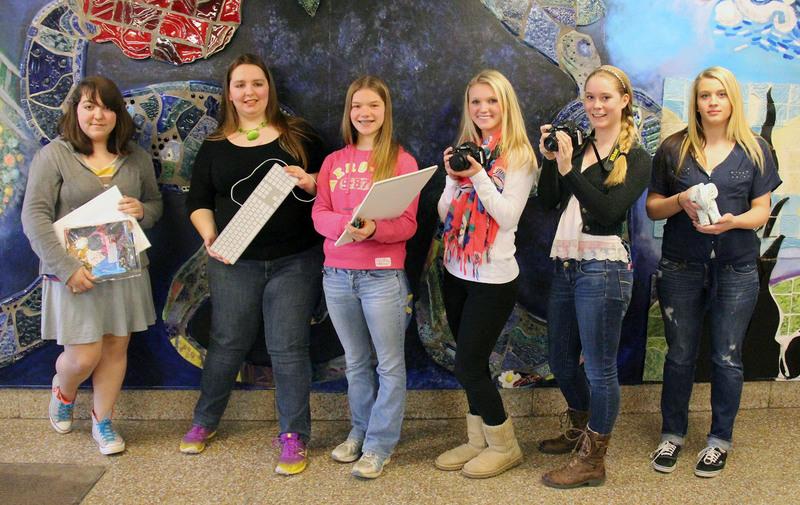 Pictured are Oswego County Student Art Show and Competition award winners from Pulaski Middle and Senior High School including, left to right: Alaura Gonzalez, Kimberly Korthas, Ruth van der Heide, Sarah Clark, Abby Chapman, and Jenna Norton. Missing from the photo is McKenna Moonan. Other Pulaski students who were invited to submit works to the show included: Alyssa Kingsley, Amber Roberts, Autumn Miller, Breann Burns, Brittney Castillo, Carly Gaffney, Cerenity Geer, Grace Farrell, Hanah Bridges, Hanna Greulich, Isabel Engelbrekt, Jackie Booth, Jenna Norton, Jennifer Shampine, Kaitlyn Trudell, Karlie Hilton, Katie Scranton, Madison Forcione, Rachel Hlavac, Randall Novak, Rebecca Simcik, Samantha Nutting, Samantha Dawes, Sarah Clark, Sarah Monnat, Shelby Goodsell, Bailey Felio, Christina Forestiere, Colton Hardy, Daniel Hefti, Luke LaVere, Madison Kennedy, Mina Aguilar, Sarah McCray, and Sophie Lawrence. The student artwork was on display at the Salmon Fire Art Center until April 26.